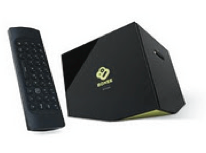 Boxee is a media player which streams movies, photos and music stored on your PC to your flat screen TV. It can connect you to the Internet and gives you access to free and paid Internet TV channels. It also allows you to install and use various applications such as facebook and twitter. You even have the option of connecting an external hard drive or USB memory stick and memory card. The Boxee can connect to your network either wirelessly or ethernet (cabled), using the supplied HDMI cable on your television. Setup is as easy as plugging it in and setting up your network. It then scans your files on your PC and will even download cover art and info. The supplied remote has a QWERTY keyboard on one side, and standard remote buttons on the other. Our verdict: Great solution for streaming of video, music and photos. We bought it!